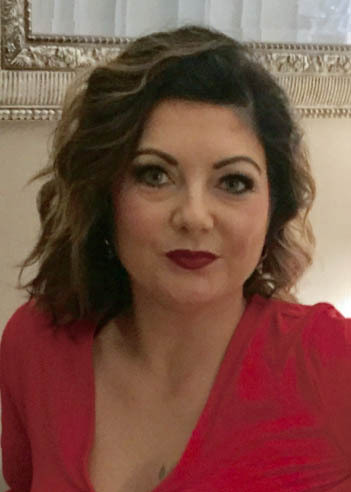 Mindy K. Smith, 39, of Waterville, OH and formerly of Fremont, OH passed away unexpectedly at her home on Thursday, September 20, 2018. She was born on September 17, 1979 in Fremont, the daughter of Mark and Connie (Kiser) Hoffman. Mindy was a 1997 graduate of Fremont Ross High School and Vanguard Cosmetology. She was currently going to Dental Assistant School at Ross College. Mindy was a stay at home mom who cherished being a loving mom. She worked at Lee’s Famous Recipe for many years. Mindy earned a Black Belt in karate and loved to remind her sisters that they didn’t. She was a die-hard Green Bay Packers fan especially Brett Farve, Aaron Rogers, and Clay Matthews. Her children Evan, Elyse, and Mariah were her whole world. She enjoyed being with family and friends and loved her dog, Otis. She was everyone’s favorite and was Aunt Min Min to all. She is reunited with her son Evan who was waiting for her at the gate with mommy kisses. Mindy is survived by her daughters, Elyse Smith Waterville, OH and Mariah Smith, Gibsonburg, OH; former husband, Josh Smith, Port Clinton, father, Mark (Hong Han) Hoffman, Fremont, OH and mother, Connie (Robert) Gratz, Sandusky, OH; siblings, Miranda Hoffman, Fremont, OH, Lilly Hoffman, Tiffin, OH and Cecily Hoffman, Bellevue, OH; grandfather Clyde White, Fremont, OH, special aunt, Eloise Starks, Fremont, OH; nieces and nephews, Morgan Liggins, Kris and Lylah Kimmet, Stella and Owen Risner; sister-in-law, Tara (Jerry) Risner, Gibsonburg, OH; brother-in-law, Eric (Nicole) Smith, Old Fort, OH; special cousins/siblings, Adrianne, Erica, Jeremy, Julian, Charles, Durand and Jimmy; God Children, Joell, Shania, Justice and Lexi and many other family and friends. She was preceded in death by her son, Evan Smith; grandparents, Ruth White, Jane Pettys and John Hoffman and her dog, Virgo. Visitation: Monday, September 24, 2018 from 4 to 8 pm at Wonderly Horvath Hanes Funeral Home and Crematory, 425 E. State St., Fremont, OH. Service: Tuesday, September 25, 2018; 11:00 am at The Church on 53, 1105 CR 41, Fremont, OH am with an hour of visitation prior to the service at the church. My thoughts and prayers are with all of Mindy’s loved ones. My daughter Nadia goes to school with Elyse and they became instant friends when she started at Anthony Wayne last year so I have had the pleasure of talking with Mindy on several occasions (such a sweet, giving person) may she be at peace. I’m so sorry for your loss, my prayers are with you and your family. There are no words to say that will relay what I feel. . .I knew Mindy, Josh and the twins so well when they were born and still talked to Josh sometimes. I loved Mindy and the twins, and when they were first born I was so close to them. I totally loved all of them. This breaks my heart and I truly believe that she is with God and Evan now. She was the nicest friend a person could have a mother unlike any other. . .God be with you Mindy and the rest of the family. I will never say good-by but until I see you again. . .my heart and prayers and love are with you. . . I am so so sorry. My prayers are with your family. I’m so sorry for the extent of your grief. May God wrap his arms around you all and give you His peace as only he can. I pray for comfort and peace for the family and Josh. so saddened by this , my thoughts and prayers !!! R.I.H. Mindy !!! We didn’t know each other but I myself have every bit of sickness that you had. I’ve been to the highest happiness and to the deepest depths of sadness. So sorry you lost the fight but when all has been done, sometimes it just gets too hard to fight. Fly high Mindy. My thoughts and prayers to my cousins & their families. Although we haven’t seen each other in years, you’re my blood & my family. May God wrap you all in His loving arms. we were always treated as tho we were…Always know that we are here for you, no matter what the need may be…We love you! So sorry for your loss Mark and Connie. So very sad to hear of Mindy’s passing I remember her as a little girl at her Grandma & Grandpa’s and the many family gatherings there on Main Street in Clyde. My brother was Ron Pettys, Before retiring, I was Elyse’s special PE teacher. Mindy was totally dedicated to her family. My prayers go out to her family and close friends. Remember the dear times and take care of her girls. My prayers sent for strength and comfort. My heart goes out to the family and friends and may she rest in peace.again you have my sincere condolences. I said a prayer, and may she rest in peace.and God bless your family. I am truly sorry for your loss. Mindy will be missed and never will be forgotten. May Mindy’s soul rest in peace with Evan by her side. Our thoughts & prayers are with you all. I pray that God brings you comfort, strength & peace as you go through this terrible tragedy. I only knew Mindy when she worked at Lee’s & she was always very kind. My heart breaks for you now. Sending thoughts and prayers for you and your family. May your family be wrapped in strength and comfort during this time! Oh Mindy, your bright light and sweet personality will be missed dearly. From cheering on the packers with my kids and sharing so many sweet memories with our kids. It is hard to imagine not seeing your beautiful smile as it lit up a room. Many prayers to your family and daughters. Sending Elyse lots of hugs! May she find strength and support. So glad I had the chance to get to know her and Mindy last year. Sending hugs from Waterville. deepest condolence. If you need anything please let us know. So sorry for your loss prayers for all the family and friends. So sorry for your loss. My thoughts and prayers go out to the entire family. I am so sorry to hear of the passing of your beautiful sister. I am praying for you and your family.